Erin & Dana – two of a kind, transplant swim-stars! Home > News > Erin & Dana – two of a kind, transplant swim-stars! “Mum! Mum! I’ve met someone just like me!” Dana Carroll’s excitement was hard to contain when she met fellow swimmer Erin Taylor at the 2017 Australian School Sport Pacific School Games, in Adelaide. After striking up a conversation, the girls discovered they had one ‘big’ thing in common; both were given a second chance at life via kidney transplant. And so their second-chance begun! Both girls with their new-found boundless energy tried a variety of sports and activities, and eventually their paths crossed during swimming in Adelaide. The girls met each other in the marshalling area, waiting for their turn to race. Both took up swimming about 12-18 months earlier for health and fitness; and because to enjoy really enjoy water safely, one has to know how to swim. What also makes these two girls special is they are the only junior female kidney recipients currently in Australia that swim competitively! There are not many kidney transplant recipients, especially children, who swim. For Dana, she is the only child kidney transplant recipient in the Northern Territory (as families tend to move back interstate for family support), and is the only transplant recipient of any kind in the NT that swims competitively. For Erin, she is the only child kidney transplant recipient in South Australia that swims competitively. In the world of Australian swimming, Dana and Erin are going places transplant recipients rarely go. 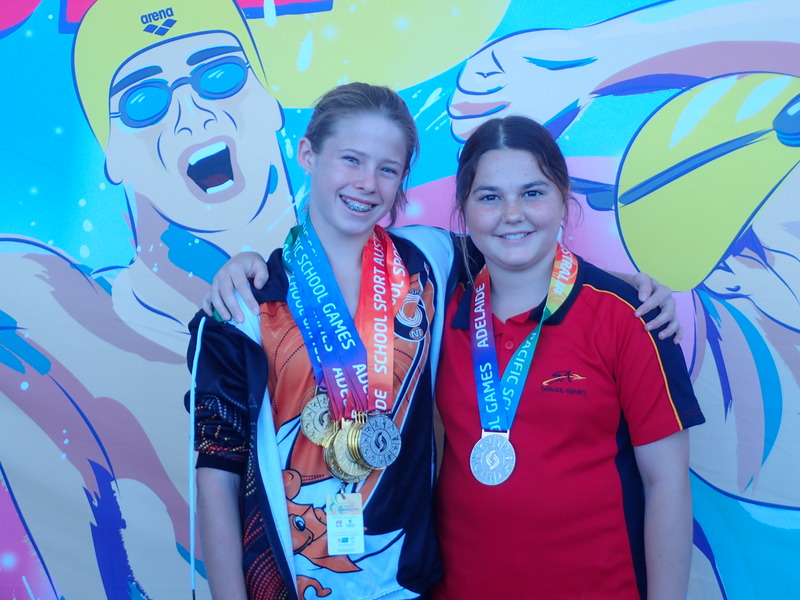 For two girls who haven’t been long in the water, they have achieved great success – both in terms of bling (medals) and personal development. The Pacific School Games has been an amazing opportunity for the girls to highlight how far they’ve come in terms of dealing with their own individual health issues, and their swimming training. Erin’s achievements at the Pacific School Games included silver in the Girls 13 & 14 yrs 100m Backstroke. Erin also set 4 Australian 13yrs & under S16 records for 50 and 100m freestyle, 50m breaststroke, and 100m backstroke. 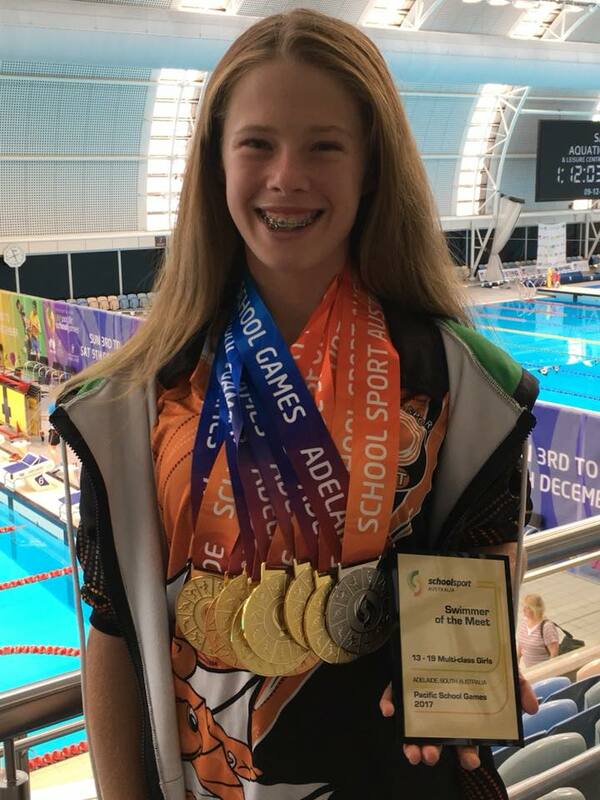 Dana’s achievements at the Pacific School Games included: Girls 13 & 14 yrs – 9 x Gold, 1 Silver (relay); set 7 Multi-class Pacific School Games records, 8 Australian 14 yrs S16 records and 1 Australian Open S16 record; awarded Multi-Class Swimmer of the Meet. The highlights of the Pacific School Games for Dana was meeting Erin, and swimming with and against Paralympians. The bling was the bonus. For Erin, the highlights were becoming friends with Dana, and winning a silver medal. Absolutely FANTASTIC effort from both Dana and Erin! Congratulations to you both, and we look forward to seeing you both compete at the Australian Transplant Games on the Gold Coast later in 2018! Dana lives in the Northern Territory. Dana’s journey started when she was 5, after getting a ‘viral’ infection, developing Henoch-Schonlein Purpura and progressing into renal failure over 3 years. After about 4 months on Peritoneal Dialysis, Dana got ‘the call’ for her transplant, thanks to an incredibly brave and generous family who made the choice of organ donation. Erin lives in South Australia. Erin’s journey also started when she was 7, when it was discovered that her kidneys hadn’t grown or developed properly, and she also progressed into renal failure. A family member gave Erin the ultimate gift and donated one of their kidneys to Erin. This article is by guest author Susanne Carroll. The S16 Multi-Class is a unique sports category for transplant recipients, allowing them to compete in state and national competitions, whilst being timed and grouped fairly. Transplant Australia is the only organisation in the country which is able to authorise S16 applications, as part of our ongoing commitment to promoting transplant sports and pathways for recipients to succeed. For more information on competing under the classification, and to download the application form, visit the page on Multi-Class Sports.